The farmers’ agitation in Maharashtra was called off on Monday evening after the state government conceded most for their demands and agreed to implement the conditions agreed upon in the next six months. A 12-member delegation representing farmers met a ministers’ committee in the afternoon. It was given a letter, signed by the chief secretary, in which the government agreed to address complaints and appeals under the Forest Act, 2006, in the next two months and relax some of the conditions for loan-waiver eligibility. The government also agreed to issue ration cards to farmers in tribal areas immediately to help them prove their land claims. Chief Minister Devendra Fadnavis told the farmers that he will take up with the Centre the matter of minimum support price (MSP) at one-and-a-half times the cost of production as suggested by the Swaminathan committee. 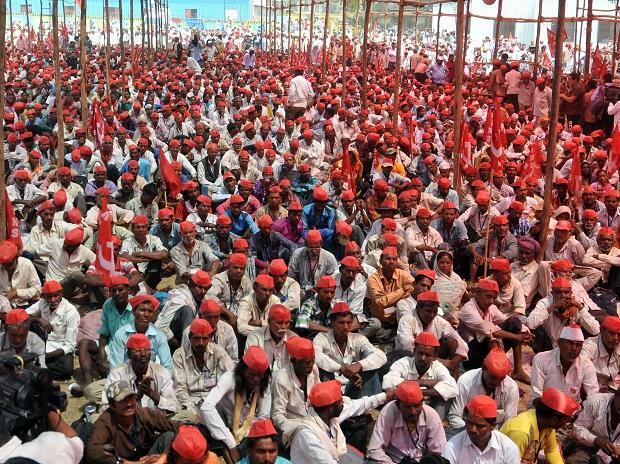 On Monday, over 35,000 farmers from across Maharashtra converged on Azad Maidan in Mumbai. They had started from Nashik on March 6 and travelled over 180 km on foot. Their plan was to gherao the Assembly. Some of the other main demands were an unconditional farm loan waiver, as some of them failed to qualify for any financial relief under the Maharashtra government’s initiative last year, and transfer of forest land to tribal farmers who have been tilling it for years. The protest march was orchestrated by the All-India Kisan Sabha, which is affiliated to the Communist Party of India (Marxist). Besides Opposition parties, Shiv Sena, a partner in the Bharatiya Janata Party (BJP)-led ruling coalition, also supported the agitation. In the Union Budget for 2018-19, Finance Minister Arun Jaitley has proposed implementing the Swaminathan committee’s recommendations. But, there is uncertainty over the cost to determine the MSP.